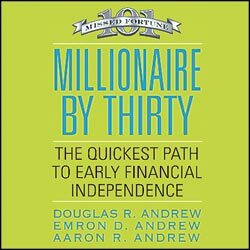 Millionaire by Thirty: The Quickest Path to Early Financial Independence is a book on personal Financial Strategy. Douglas R Andrew wrote this book in conjunction with his sons Emron and Aaron. The book is suppose to be based on the experiences of Emron and Aaron, but unfortunately I don't believe they did the majority of the writing. I have read The Last Chance Millionaire: It's Not Too Late to Become Wealthy also written by Douglas Andrew, and they are practically identical. The only difference is that Millionaire by Thirty uses the Andrew sons as an example a few times. However, the strategies mentioned in the two book are identical. The only flaw in these strategies is that they assume real estate never loses value, especially in Millionaire by Thirty. I actually am a fan of the alternative view on financial planning. I love the fact that this book takes on traditional thinking. The majority of financial planning strategies are a joke and are based on how the planner gets paid. If you have already read any other of Douglas Andrews books, I wouldn't bother with this one. If you haven't I would still recommend you start with The Last Chance Millionaire. Atlease this one is so much oriented around real estate never losing value. Overal, it's a decent book and easy read.